Geeeez, we've got all these girls here, (shouting) but in this outfit none of them are going to notice mee~!! Mikoshiba Momotarou! 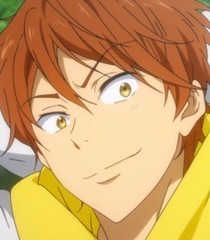 I'm a first year in the Samezuka Swim Team! My speciality is backstroke! My hobby is hunting for stag beetles! The biggest one I've caught so far was 8 centimeters!